I was curious if anyone has experienced an issue with iron golems rapidly multiplying. I currently have a village that I created and spawned two villagers (everything else has been survival). Then traded with them and gave them bread. I thought it would also be a good idea to craft an iron golem for protection. The villagers started to have offspring and the village grew quite nicely. Somewhere in the building/growing process, I crossed the threshold of 21 doors and to my delight, a new golem spawned. This is where things started to get a little odd, they kept spawning. Once there were 6 iron golems, I stopped building in the area, trying to figure out what was going on. 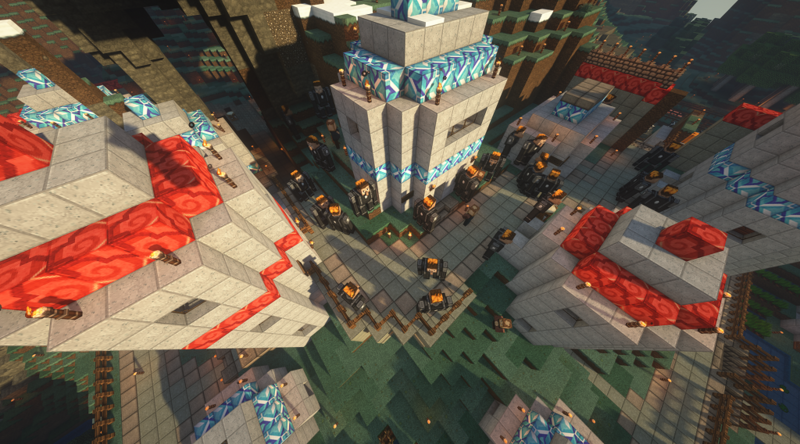 There are now either more iron golems or close to a 1-1 ratio of a villager to iron golem. The villagers are a little hard to count, but to my best ability, I am noting about 20 villagers and 25 golems. I have tried to do searches, though everything I search only pulls up issues about iron golem farms (maybe not using good keywords). I do not see any posts on iron golem populations that are doing this? Is it possible this is a unique instance? or a bug? Or maybe the Mystics of Monkay Mountain are doing something to make more iron golems? I am currently using a Realms server, So no mods and pretty vanilla. I was just more curious if anyone else has had this occur? Any thoughts or ideas? Attached is a photo of the village of Monkay Mountain, and its golem population. If pre-1.14 snapshot, the most probable cause is spawned golems exiting the 16x16x6-high volume [centered on the village center (average of the three dimensional door positions)] in which they can spawn/which is checked for iron golems when attempting to spawn one. If the above is true, you've unintentionally produced the conditions on which pre-1.14 iron farms are based. The version I am on is 1.13.2. I am up to 30 now. =] I just thought there was a balance with villagers. I guess I will watch some videos on iron golem farms. Maybe I can see what causes the spawning from there. I enjoy them being there, but just not 30 of them. If you find out where they are spawning and put a fence around it that should keep a few golems in the spawning area so no more would spawn. With only 20 villagers it should be enough to keep 2 golems in the spawning zone. On the other hand, if you can funnel the excess golems (without also funneling villagers) to a separate location... you have the beginnings for a nice automated iron farm.